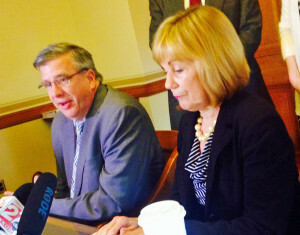 The co-chairs of the Legislature’s budget committee say they expect the committee will reject a proposal to move state employee health plans to a self-insurance model. Sen. Alberta Darling (R-River Hills) said there’s no convincing evidence the move is needed, pointing to the fact that state employee health insurance premiums increased the last time the state used a self-insurance approach. “With the uncertainty with Obamacare and national insurance companies, I think we need to stay where we are,” she said. Speaking in Appleton, Walker argued it was wrong to dismiss the savings at a time when lawmakers are asking to spend more money on transportation. Nygren said the finance committee will look for other ways to off-set any effect the change could have on the state budget.